Are you looking for some UK slot sites to try? Ever heard of Spin and Win Casino before? If not, this is the perfect place to learn more. The home page says we should “let the good times roll” and we have to agree. Will you? So what should you expect from Spin and Win? Well, the first thing that struck us was the sheer professionalism of the site. You can review many of the thrilling games by scrolling down on the home page, without having to go and look for them. That alone is a big plus in our book. The main draw here is a whole slew of slots, but you can also try table games, roulette and even scratch cards (although for some odd reason you have to click the link in the footer to reach those). The website is owned and operated by Daub Alderney Ltd, and is one of several the company manages. Where to begin?! This really is the meat-and-potatoes part of the site, and you could spend hours just looking. If you look at the games on the home page, you can narrow them down to the specific type you want to play. For instance, when you’re looking at slots, you will see categories for new, jackpot, featured, exclusive, movie and adventure slots… you get the idea. Suffice to say there are lots of ‘em! At the time of writing, they had a mix of 25 table and card games and half-a-dozen versions of online roulette. They even have a live casino with real dealers who manage games of roulette and blackjack. Maybe this could be the preferred spot for you. If we had to pick fault somewhere (and it’s very hard to do, honestly), it would have to be with the fact you can’t play any of the games in practice mode – at least not if you are just casually looking around with the idea of joining. Maybe you can play for fun when you become a member, but it’s a shame you can’t even see a video of what to expect from each game. New slots at Spin and Win Casino include Copy Cats, When Pigs Fly!, Colossus FracPot, The Sky’s the Limit, Grim Muerto and NRVNA The NXT Xperience. We always think it’s best to find a casino that offers games from a huge host of providers – and that’s exactly what you get at www.spinandwin.com. Major players including Microgaming and Net Entertainment (otherwise known and loved as NetEnt) provide games for this site. However, you’ve also got the likes of Daub Gaming, Bally Technologies, WagerWorks and Play’N Go to look at among others. Okay, so Spin and Win does accept debit cards but they don’t recommend them (apparently they can be rejected by some banks if you use them at online casinos). The good thing is you have plenty of other options too, including MasterCard and Visa Credit, as well as PayPal, Neteller and Paysafecard. For further details on banking, click the link at the bottom of the site. The banking page is chock-full of info, so you would probably expect their FAQ and help features to be pretty good too. You’d be right, with the FAQ alone featuring 17 questions and answers. If that’s not sufficient, you can learn more about the Spin and Win online casino by going to the support page. This gives you options for emailing, phoning or using the live chat option to get in touch. 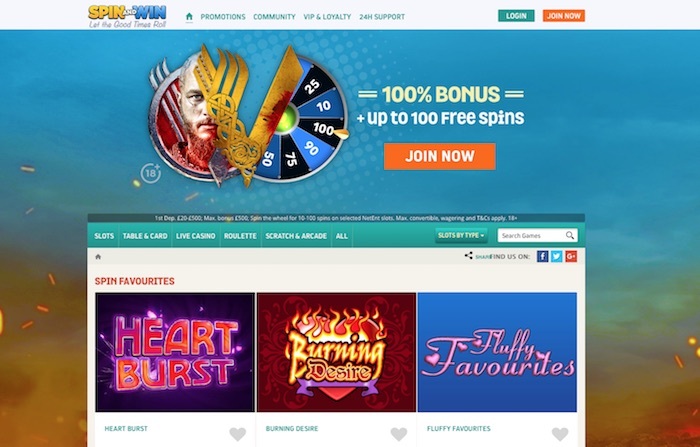 The Spin and Win Casino is among the most trusted UK casinos you will find today. It has everything a great online casino should have, and probably plenty more you weren’t expecting as well. We think you’d be hard pushed to find a better selection of games anywhere, which is why we’re awarding them a 90% rating. But don’t take that as gospel – check it out for yourself now.